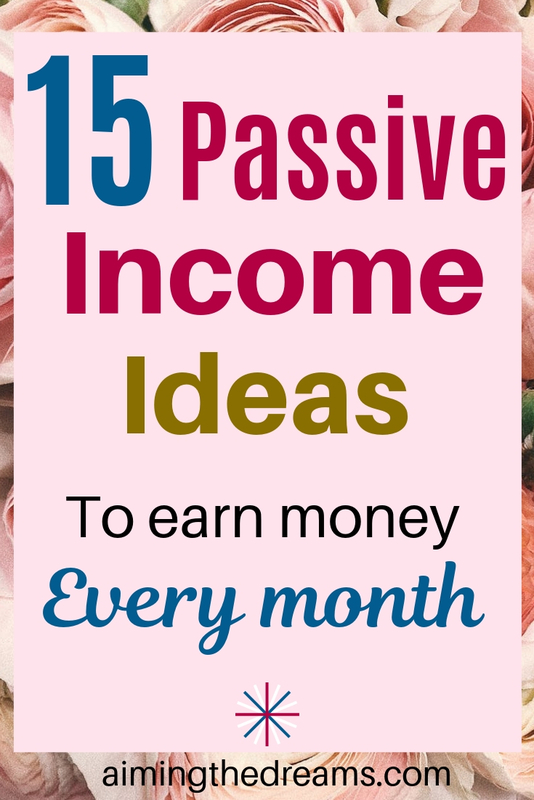 Passive income ideas have made it possible to have more than one income stream. Rich people are known to have atleast seven income streams. It doesn’t mean they do seven jobs. They build passive income streams which doesn’t need them to be present on their work 24*7 to earn money. In this digital world, internet has made it possible to have more than one income stream for ordinary people like us. Disclaimer: This post contains affiliate links which means I may get compensated if you sign up through my link and make a purchase. For full disclosure, read this. If you are keen on making some extra money then survey sites give you that opportunity to earn some money. You can use that cash to invest some money or build your emergency fund. 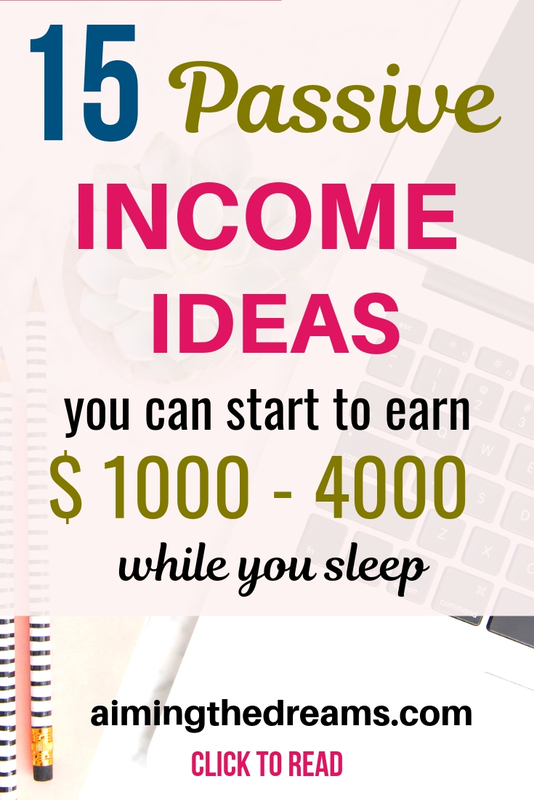 There are many passive income income ideas that can be started to earn money. 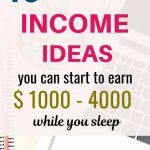 Those who are doing extraordinary work of having more than one income stream are the one who paid attention to these ideas of passive income. Income you will get from dividend stocks will definitely be passive income. Even Warren Buffet says that he loves dividend stocks. Because dividend stocks pay you regularly in cash to your bank account. But you need to be careful with the stocks you choose. You may take the advantage of compounding with the dividend stocks. Before jumping into this world of dividend stocks, educate yourself . It is believed to be risk averse but it is not. Like all other investments, dividend stocks also have some risk associated with them. This is really an online world. You shop online, you make friends online and reading/learning online is also common these days. If you have some skill which you can teach others and make them learn the skill to earn money, It will be beneficial to both of you. eCourses can be made into ebooks or videos. Either way it can be used. And you can use a platform like teachable or Udemy for your course. If you are good at writing and can write something valuable, start writing an ebook. It is not easy and very simple to write a book and make money though. You have to do real smart marketing your self so that you will be able to sell your ebook/eCourse. If you want to create a passive income stream , creating a blog is really best thing for you. It will take some time to make money and it is real hard as well as smart work. Because millions of blogs are created everyday. And you need to stand out from those blogs. But with the right strategy to accomplish blog goals can lead you towards success. It is really possible to make money . There are bloggers who are doing it. Sara from Gathering dreams is earning good income from a new blog. REIT is a company that manage, operate or finance an income producing real estate. Real estate investment trusts are historically considered to be the best asset class. The rent generated from the properties is distributed to the shareholders. This one is my favourite too. We have a four bedroom house and we always have a spare room to rent. We normally rent this room to students. 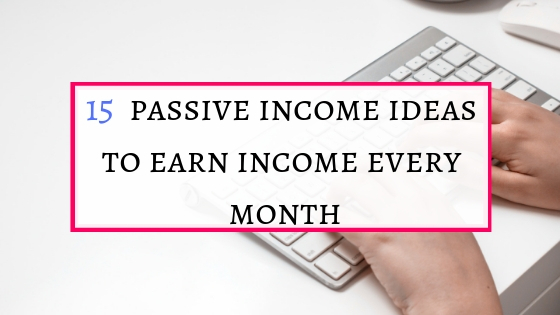 This income is totally passive. If you are not renting, it means you are just leaving the money on table. You can use Airbnb to rent out your rooms. This is really a good idea to rent your flat/ house or bedroom to people who visit your place for few days. One of my friend always rent on Airbnb whenever she visit her family overseas. This let her earn the money she spend on her own travel. A very good strategy to make some money. Normally we like to save money in day- to- day savings account. But returns from these accounts are very low. Look for high yielding bank accounts which can give you good yield. There are many options to invest your money and let money do the hard work for you but if you are more risk averse then go for high yielding savings account. Affiliate marketing is a form of marketing where you earn money for referring people to the product and you get paid the commission for referral. There are many forms of affiliate marketing. You can become an affiliate for a product/course or you can create an affiliate program for your own products or courses. Either way you will earn money . To start a business from scratch is difficult and time consuming. If you have an idea to start your own business , go for it. But if you want to save time and hard work which goes in starting something from scratch, buy an already existing business. As I am in Australia, this site works well in Australia to buy or sell business. Earning cashback from cashback sites is also a source of passive income. You are not doing anything for this but you are earning money. The feeling which you get after getting cashback from cashback sites is amazing. It is one form of passive income. You will not become rich but adding some money to your income stream doesn’t hurt. We all love shopping and also love the idea of getting money after shopping. If you are like me, then start shopping with cashback sites. This can be bit tricky but if you are an outgoing person and don’t mind sharing a bit of your personal life then it can become a passive income stream for you. You have to be consistent in your efforts and build a huge followers list. Be engaging and ready to solve a problem. Because we ll like to follow and trust people who are genuine and like to help us solving our problems . If you feel like you are a person with these qualities and have large following, leverage social media platforms for your profit and start earning money. You can use both affiliate marketing and advertisement to earn income. You will not get rich but starting somewhere is the key. If you like to watch videos and then have some kind of. Swagbucks pay you to watch videos, doing internet search and for surveys. You can also add swagbutton on your mobile or desktop and earn for watching videos. Bond and CD laddering involves little to no risk. Though the returns are no that high but risk is almost negligible. Certificates of deposits mature at different times of the year so when they mature, you take the money and hence the profits. Peerstreet is the third largest real estate crowd funding site. It works as a middleman between investor and the borrower. It is a peer to peer lending for real estate projects. Here the borrowers are considered to be the professional investors who purchase the property, fix it up ad sell at higher price. Peerstreet claims to have lower fee than other similar platforms. Also it gives you good returns. If you feel comfortable then you can invest in this crowdfunding platform and start earning passive income. It is said to give you around 5-6 % return on your money invested. Lead generation websites are for sending referrals to the companies which pays you for generating the lead. Because the leads which comes to your site are the warm leads and when you would refer them to the professionals, you will get paid. Everybody is creative in their own style. Some people are very good at graphic designing while others are good at crafts. Leverage your skills to build your passive income stream. This will help you in building your side business and side income. Photography : If you are good at photography then you can use your skills to have a side business or license your photos. Product designing : If you love to design some product then use Zazzle or cafepress to put those designs and graphics on any product and make money. Please share this post if you like it. 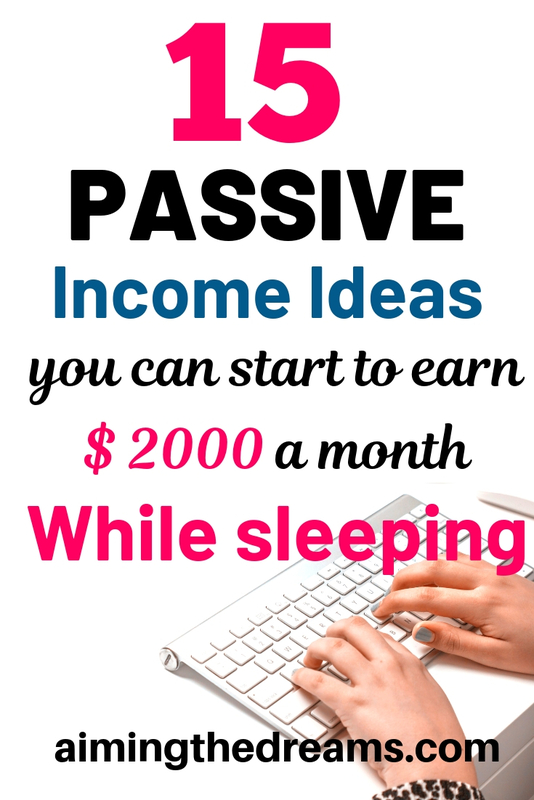 It may help me as well as somebody else in finding passive income ideas.